Well, I hope everyone had a wonderful Christmas! Now onto some site news. Starting in 2012 there will be some big changes to this site. I will be adding new features as well as give you the viewers a bigger presence. So, enjoy your holidays and look for some exciting new things here soon! 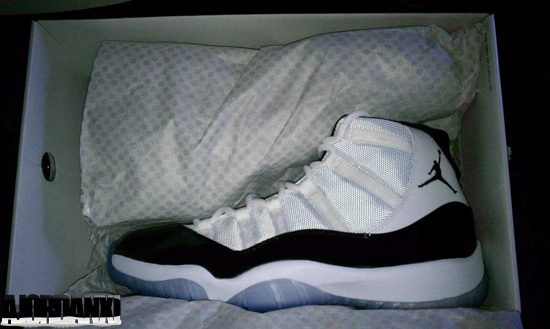 As you all know, the highly anticipated return of the "Concord" Air Jordan XI came on December 23rd. All over the world, chaos ensued. One of the biggest sneaker releases of 2011. But the big question is, did you get them? As you can see from this teaser pic above, I did. If anyone knows anything about me, then you know that this is my all time favorite sneaker and colorway. The is the shoe that started it all for me back in 1995 when I saw them for the first time. Yes I have them from then, not originally, but through collecting over the years. Then in 2000 I was able to grab a few pairs, same with the DMP pack from 2006. So when I found out 100% that the Concord's were re-releasing this year I started planning right away as I had to have multiples. So, I contacted friends throughout the year trying to secure some pairs, but it wasn't until closer to the release date that I really had to make moves. The pair pictured I received from a friend (thanks!) and got it in a few days before the official release so, one pair down. Then off to NDC for the two pair limit at midnight. The site was chaotic and just when it seemed that I would be unsuccessful, my order finally went through. I am happy to report that my two pairs arrived this morning as I opted for the next day air shipping method in hopes I would have them for Christmas. I also headed over to Eastbay where their site was just as bad, and after over an hour, I got through and ordered my pair of infant soft bottoms and toddler hard bottoms as I have with the 2009 Space Jam and 2010 Cool Grey releases. I also have another pair of Concord's coming from said friend as we struck a trade, so those will be here late next week. All in all, I will have four pairs for myself and I am happy with that. So if you were successful in getting them, unsuccessful or simply did not want or try to get them. Please share your stories in the comments section below! Please note: I do not ever buy to re-sell. I buy for myself first and foremost so sorry folks, none of my pairs will be for sale. I plan to wear them all eventually. So with all that being said, expect a group shot of my 2011 Concord's as soon as they have all arrived. With that, I am signing off. Hope everyone who celebrates has a Merry Christmas and Happy Holidays! Stay tuned for a big update and re-vamp to this site. I will be updating more frequently and possibly even add others as well.